I will admit that I went into this book with slightly higher than normal expectations. 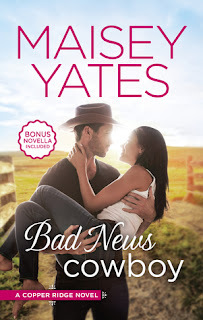 I so thoroughly enjoyed the previous book in the series, Brokedown Cowboy, that I expected this book to continue at the same level. Perhaps that isn't fair, but that was where I was. Sadly, this book ultimately didn't live up to my high expectations. This is the third book in which we've met Kate and Jack, so we know them fairly well. However, we don't know them so well that we don't need any additional backstory. Kate's is what was expected--as we've already gotten the story from her brother's viewpoints, there really wasn't that much to add. Jack's, however, was just more of the same. I'm starting to think that Copper Ridge is populated entirely by people with crappy parents. At this point, I really needed Yates to go in a different direction with one of her characters. I can't say that I really felt the affection between these two characters. Personally, I find the friends-to-lovers trope tricky as it either comes off as at least one of the parties harboring feelings for the other for some time or it just comes out of nowhere and, in this book, it was definitely the latter. I also felt that the angst about the relationship was a bit too manufactured. I mean, there was nothing that couldn't be solved with, I don't know, people talking to each other. What I enjoyed most about this book, though, were the other characters. I loved seeing Liss and Connor and how their relationship had progressed. With Sadie and Eli, there was continuity between this book and the previous installment (although they still didn't connect to the characters in the first book) and were more entertaining here than they were before. I did enjoy this book enough to continue in the series, although that may be because I had already read the holiday novella that comes after this book. I guess I can chalk this one up to the fact that not all the books can be winners.